Turn on any radio station and I bet you’ll hear a lyric about fire. I know I’ve been keenly aware of that lately. Fire represents passion. It’s consuming. It’s strong. It can be beautiful. It also can be terrifying and destructive. This last week, a huge part of Northern California went up in flames. It happened suddenly, spread quickly, and has affected thousands upon thousands of people. Every day all of us turned on the news first thing to see how much the fire had spread. Every night people went to bed praying that more homes and lives wouldn’t be taken. My husband and I came back from a weekend camping trip to texts and phone calls about the fire and whether we were okay. We drove, in all of our grungy glory, straight to my grandparents’ house just a few miles down the road from us to help the family save some of their many treasures and heirlooms right before the officials called for a mandatory evacuation of the area and blocked all roads back into their golden California hills. Less than 48 hours later our home was in the “advisory” evacuation zone and my husband packed up our cats, photo albums, and my wedding dress and moved us into my mom’s house in the next town over, all while I was at work, hardly concentrating and probably as white as a ghost. For days we were on pins and needles. 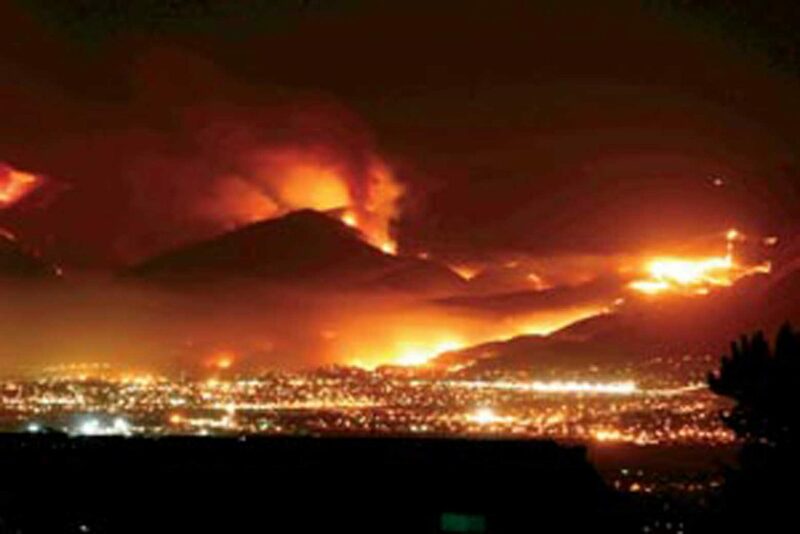 Waiting for alerts, with me commuting with tears in my eyes as I watched smoke billows fill the sky and flames over the crest of the now blackened hills. I want to emphasize here that I was so blessed and fortunate. We were able to move back home five days later and the fire never touched the homes in our area. All week I’ve been struggling between emotions of fear, relief, and guilt. Fear of losing my home, relief any time I heard that the fire was even a little more contained, and guilt for feeling so much when I had been affected so little. My church had a multi-denominational service on Friday night. After a week of the church acting as a donation site for any and all goods that evacuees may need, people from all over the community came together to pray and to worship. I realized then that I was angry with God. I hadn’t allowed myself to process that emotion. Fear, yes. Relief, yes. Guilt, yes. But not anger. And there I was crying and asking God why he would let something like this happen. And even now, days later, I can’t begin to pretend I know the answer to that question, but here is what I do know: I know that the fire is terrible. It’s caused pain, death, destruction, fear. People have lost loved ones, homes, memories, livelihoods. But I also know that the embers of pain have sparked great faith. The grit and the grace of my community has never been more apparent to me. People are banding together in a way that is so contrary to what the news wants us to believe about the status of relationships between races and religions and classes. So fire, like the songs all seem to suggest, can mean something beautiful and restorative and strong. The flames are not all out. Through the amazing efforts of the firefighters, though, they are more contained every day. Coming back home, I felt more grateful than I had in ages just to walk around my little apartment and reunite with all of my belongings. Some people, however, did not get that luxury. So here’s a call to action, ladies. If you are in the area, apply some grit and find a way to volunteer and help out with the efforts. If you are not send your prayers and consider whether you’d like to extend the grace of helping the families in need. And we can all be grateful for the people who are cultivating beauty in this destruction. The grit and the grace of my community has never been more apparent to me. If you would like to give toward the Northern California wildfire relief efforts, please visit The Salvation Army’s website here. Katie Sue is a suit-and-heels attorney all week and an overalls-and-sandals aficionado as soon as the weekend rolls around. She lives in Northern California with her husband Josh and her two cats Butch Cassidy & the Sundance Kid.